The Douglas World Cruiser (DWC) was developed to meet a requirement from the U.S. Army Air Service for an aircraft suitable for an attempt at the first flight around the world. The Douglas Aircraft Company responded with a modification of their DT torpedo bomber. Five of these aircraft were ordered for the round-the-world flight, one for testing and training and four for the actual expedition. The DWC differed from the DT in having a greater fuel capacity for greater range. The cockpits for the pilot and crewman were also located more closely together. Like the DT, the DWC could be fitted with either floats or a conventional landing gear. The four expedition aircraft, named Boston, Chicago, New Orleans, and Seattle, departed Seattle, Washington on 4 April 1924 for the expedition around the world. The "Seattle" crashed into a mountain in Alaska on 30 April. The crew, Major Frederick L. Martin and Staff Sergeant Alva L. Harvey, survived and made their way through the wilderness to safety. The other three aircraft continued on through Asia, the Middle East, and Europe, relying on a carefully planned logistics system, including pre-positioned spare engines, to keep the aircraft flying. The "Boston" was forced down while crossing the Atlantic and damaged beyond repair while being recovered by the U.S. Navy light cruiser USS Richmond. The remaining two aircraft continued across the Atlantic back to the United States, where they were joined by the test aircraft, now christened "Boston II". The aircraft returned to their Seattle starting point on 28 September 1924, 23,942 nm (44,342 km) and 175 days since departing. The "Chicago" is now part of the collection of the Smithsonian Institution, on display at the National Air and Space Museum on the National Mall in Washington D.C. Beginning in 1957, the "New Orleans" was displayed at the National Museum of the United States Air Force in Dayton, Ohio. The aircraft was on loan from the Los Angeles County Museum. In 2005 it was returned to the collection of the Los Angeles County Museum of Natural History, where it is now on display. The wreckage of the "Seattle" was recovered and is now on display in the Alaska Aviation Heritage Museum. The original "Boston" sank in the North Atlantic, and it is thought that the only surviving piece of the original prototype, the "Boston II", is the aircraft data plate, now in a private collection. After the success of the World Cruiser, the Army Air Service ordered six similar aircraft as observation aircraft, retaining the interchangeable wheel/float undercarriage, but with much less fuel and two machine guns in the rear cockpit. 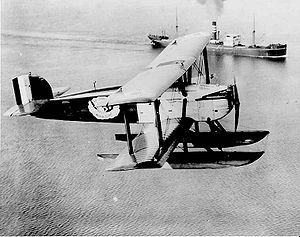 These aircraft were initially designated DOS (Douglas Observation Seaplane), but were redesignated O-5 in May 1924. 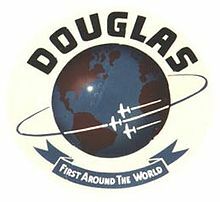 Picture - Douglas Aircraft Company's logo was later changed in commemoration of the first aerial circumnavigation. The success of the DWC established Douglas Aircraft Company among the major aircraft companies of the world and led it to adopt the motto "First Around the World - First the World Around". The company also adopted a logo that showed aircraft circling a globe, replacing the original winged heart logo. This logo evolved into an aircraft, a rocket, and a globe and was adopted by the McDonnell Douglas Corporation following the merger of Douglas and the McDonnell Aircraft Corporation in 1967, and then became the basis of the logo of the Boeing Company following its acquisition of McDonnell Douglas in 1997. Picture - Chicago on display in Washington, D.C.
Francillon, Ren� J. McDonnell Douglas Aircraft Since 1920: Volume I. London: Putnam, 1979. ISBN 0-87021-428-4.